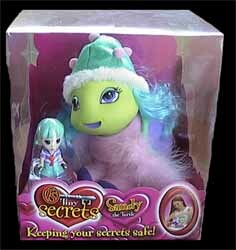 I don't know what it was about Sandy the Turtle, but I thought she was the best of the Tiny Secret toys we reviewed. She's green (obviously, being a turtle) and she has the cutest face you've ever seen. Sandy has curly blue hair, a bobble hat and a secret chamber hidden in her back that allows you to store any secrets inside. You also get a special girlfriend figure, who is also the key to opening up your hiding place - so you'd better keep her well hidden from prying eyes. I really do think that this range of toys is great for young girls. Not only can you use them to store secrets, but you can have fun brushing their hair too. Add to that the fact that they look great as bedroom ornaments, and you have yourself another great F.E.V.A release. And what is most surprising of all is that they only cost £12.99. These are certainly a very affordable accessory for any young girls bedroom. Other stockist of this item include: Toys 'R' Us, Woolworths and all good toy shops.